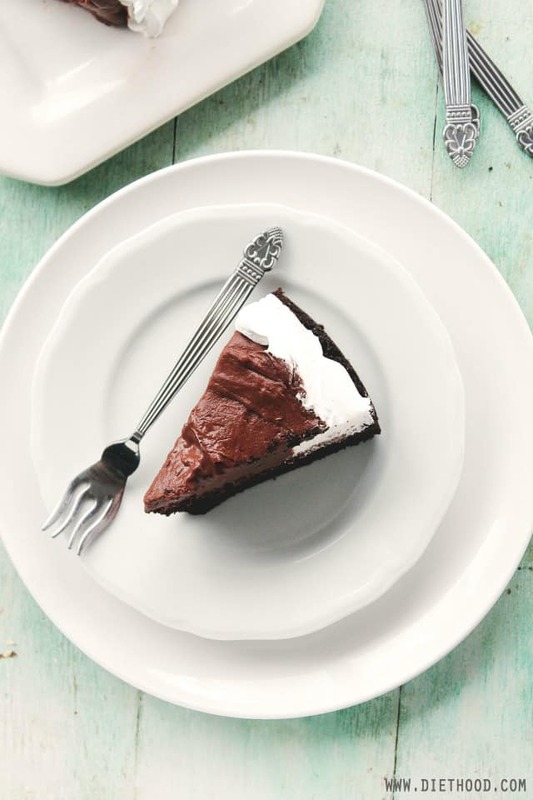 Chocolate Mousse Cake – because ain’t nobody got time for just one fat, moist, scrumptious layer of chocolate cake; the delicious layer of Mousse is a MUST! 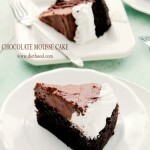 How about a Chocolate Mousse Cake to get the week started?! You know how when it gets hot out, you crawl back inside your house to turn on the AC? I did that the other day, but the AC wasn’t having it. We’ve been in our new house for about 6 months now and everything was going pretty awesome until the other day. Seriously? How complicated does it have to be to turn on the Air Conditioner?? Lemme tell you! It took 3 hours, 2 men, and 1 woman (ME!) to figure it out. E=mc2 did not take this long to figure out. And waited…and waited. The beast wasn’t having it. Since I’m too cheap and will never call a real repair man to fix something, I called my dad, the Priest, to come and help me fix it. Several button-pushing, on-and-off-switching, lever-turnings later, we figured it out! When that sucker finally gave in, we celebrated! Honestly, I think the AC-installers do this on purpose so that you will HAVE to call them to come by and “fix” it for you. I don’t blame ’em – we all gotta make that money. At the end of it all, the three of us sat down and each had a HUGE slice of this Chocolate Mousse Cake. At least we know how to properly celebrate a win. Also, seriously? This cake is fantastic! I can’t describe just how amazing that layer of mousse IS. Swear, I had a few spoonfuls before adding it to the cake. Who wouldn’t?!? I used a hazelnut-flavored milk chocolate for it – best idea, ever! And then, because a layer of chocolate cake AND a layer of mousse wasn’t enough, I added my favorite Whipped Vanilla Frosting, for good measure, of course. 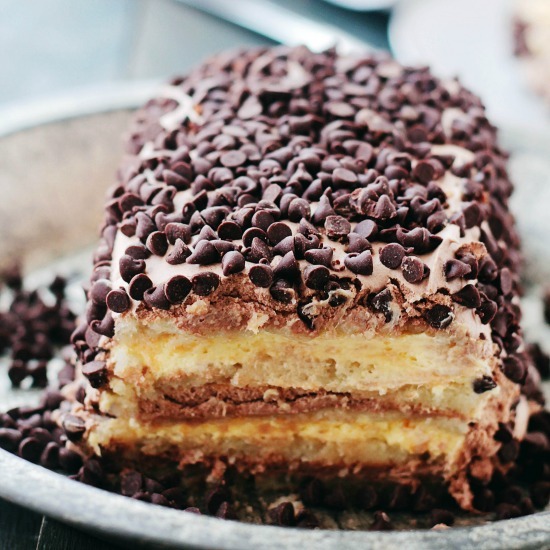 If you are craving a big piece of cake, you need to make this and just hide it in the back of the fridge so that you can eat a slice-a-day for 8 days straight. And maybe even eat two slices on the last day, just to make sure that it’s perfect and share-worthy. 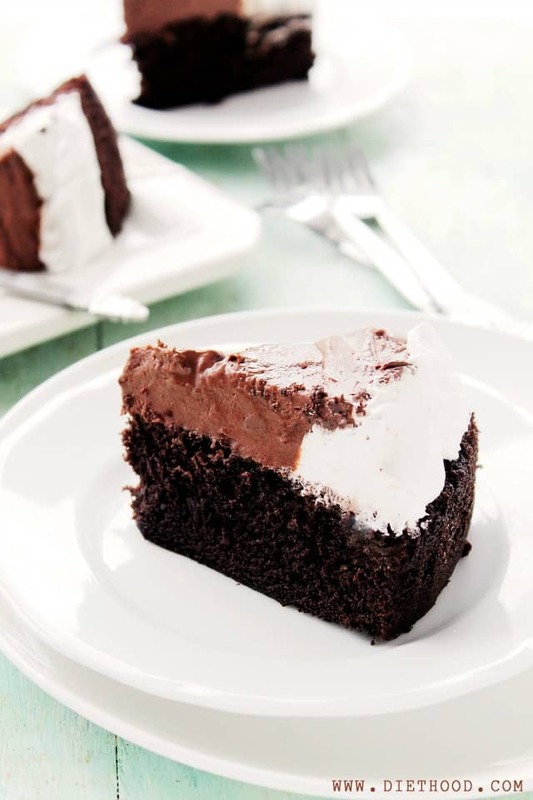 Moist, scrumptious layer of Chocolate Cake topped with a delicious layer of Mousse and Whipped Vanilla Frosting. Line bottom of 9-inch springform cake pan with parchment paper. Transfer butter into a small metal bowl. Lightly whisk in vanilla; set aside. In a medium mixing bowl, whisk together flour and cocoa powder; whisk until combined. In a separate large bowl, whisk eggs and sugar until blended. Pour water in a large skillet and bring to a simmer. Place bowl with egg mixture in the skillet, whisking constantly until egg mixture is lukewarm, about 2 minutes. Place the bowl with butter in same skillet over low heat to keep warm. Using electric mixer, beat egg mixture until cool and tripled in volume, about 5 minutes. Sift 1/3 of flour-cocoa mixture over egg mixture and gently fold in with rubber spatula. Fold in remaining flour-cocoa mixture in 2 more additions. Fold 1 cup of cake batter into the warm butter; fold until incorporated. Using rubber spatula, gently fold butter-cake batter mixture into remaining cake batter. Transfer the batter to previously prepared pan. Bake for 30 minutes, or until a toothpick inserted into center of cake comes out clean and the top of cake springs back slightly when gently pressed. Cool completely in pan on rack. Remove completely cooled cake from pan and invert cake onto rack; remove parchment and set cake aside. Pour enough water into large skillet to reach depth of 1 inch; bring to simmer. Place chocolate in metal bowl. Remove simmering water from heat and place bowl with chocolate in the skillet. Remove bowl from water and let chocolate cool down. Using electric mixer, beat cream and salt in another bowl until very soft peaks form. Mix 3 tablespoons water into melted chocolate. Slowly pour whipped cream over and fold into melted chocolate just until incorporated. Brush top of chilled cake with liqueur. Starting 1-1/2 to 2 inches from the edge of cake, spread mousse over cake. In your mixer's bowl, combine chilled heavy whipping cream, vanilla and sugar; beat the mixture on medium-high until soft peaks form. Pipe vanilla frosting around the empty edges of cake, pipe up to same height as the mousse. I am not seeing the recipe…. Where do you find Hazelnut milk? That sounds delicious even in itself. This cake is addicting my just looking at it. Love the gorgeous fork too! I actually cant stop myself from drooling! Kate this looks incredible! Wow!!! Super delicious!! So glad you got your a/c fixed especially since it is a new house and summer is right around the corner. Thanks for the yummy recipe!! Great for summer!! This cake is delicious, so soft! Chocolate Mousse cake! Enough said! 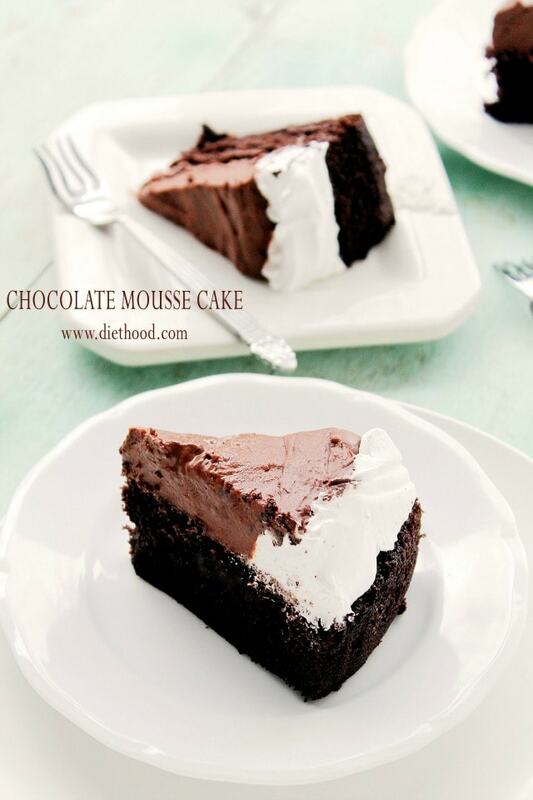 Your mousse cake sounds divine! Pinned! I can imagine this cake needed several taste tests 🙂 It looks wonderful! I’m so happy to have the ac on again. I love summer! We are about to turn on the AC. It’s getting hot in here, and baking just makes it worse. This cake looks amazing. Every Monday should start with cake. Pinned. Oooh I love this. 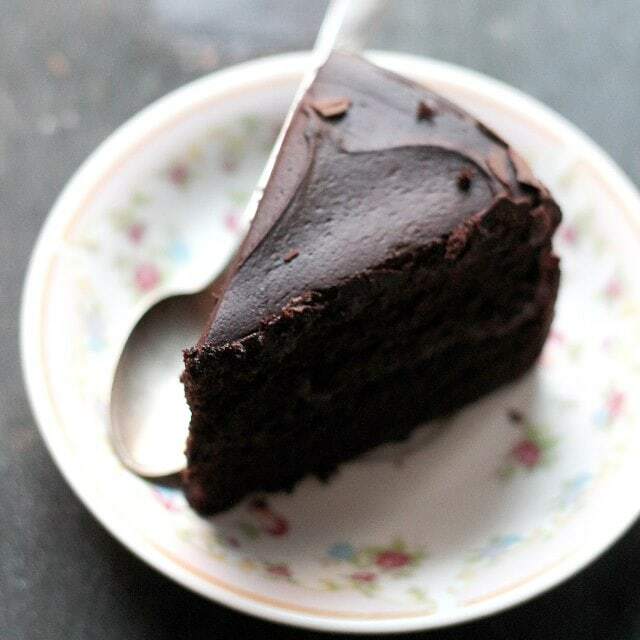 Mousse and moist, dense chocolate cake… the best of both world’s. I’m seeing my next birthday cake here, I think. I would consider installing an AC and having it breakdown so I need hours to fix it if I could get a slice of that as reward afterwards… 🙂 seriously. How good does that look!!?? This cake is insane! Love your photos! This will definitely wipe away any AC calamities – that’s for sure!! Stunning! My kind of dessert! The chocolate cake, the mousse – I’m in. On a side note, I am now glad I live in an older house…. no new style A/C to figure out lol. Just flip and it’s on. Love this!! I haven’t seen a mousse cake before but I am so glad I have now. Need soon. Pinning!! I’m glad you celebrate things like ACs with mousse cake! That is my kind of celebration. 🙂 Especially when it is so rich and creamy! Yes please, my Monday needs this cake. Love! I’ll take a slice….better make it two! Gorgeous! We went through the same thing last summer, which was so hot. In the 90’s here all week so ours better work! And with that heat, this cake would be the ultimate. Maybe if my son wins the championship tonight, I can give this a shot to celebrate with. By the way, love your writing style, so refreshing and fun! I am all about mousse cakes! Love this one! Looks amazing! Pinning!